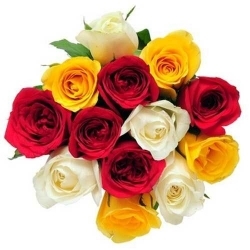 Fb Flower Basket offers you the best Services and quality for flowers and cake deliveries in Ahmedabad India, We deliver cakes and fresh flowers from your neighbourhood florist. 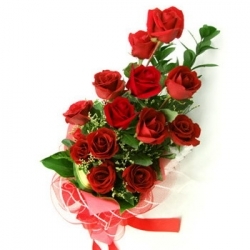 Fb Flower Basket is dedicated to deliver and ensure timely delivery. A classic expression of affection! 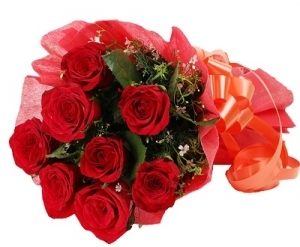 The simplicity of Red Roses is the perfect way of expressing everlasting Love. 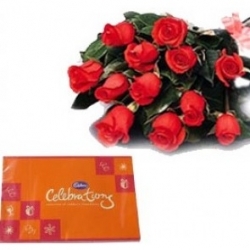 Bunch of 10 Red Roses with seasonal fillers wrapped in cellophane. 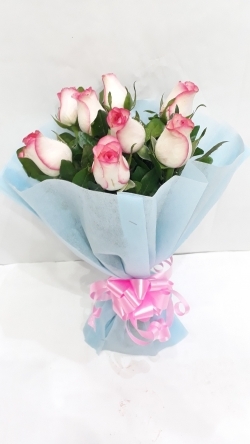 A nicely blue paper wrapped bunch of 8 pink roses to lighten up their mood. A bunch of 12 mix roses to spread smiles. Order now at FB Flower Basket. 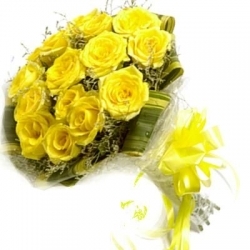 A bunch of 12 Yellow roses with cellophane packing at FB Flower Basket to lighten up their mood. A gorgeous bunch of 10 red carnations held together by red crape paper and matching ribbon, is a perfect match for your emotions of pure love. Order now at FB Flower Basket! 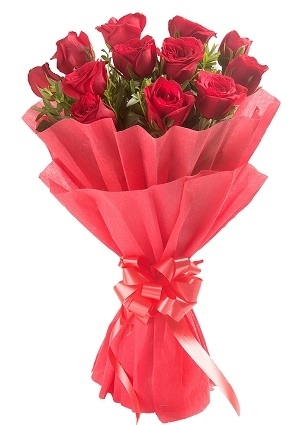 A beautiful Bunch of 12 exotic red roses in red paper packing to make the day bright and beautiful. 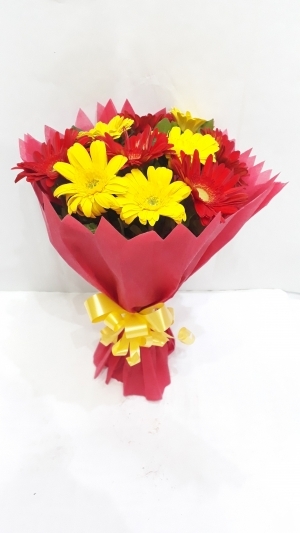 This is an arrangement of 5 red and 5 yellow Gerberas with exotic red paper packing. This concoction of bright Gerberas by FB Flower Basket is a perfect way to lighten up any dull surrounding. 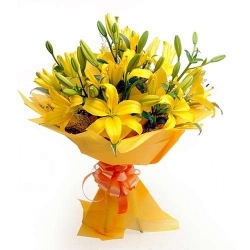 It is a perfect present to cheer up a recovering patient, or make up for a fight or just to brighten up your office desk. 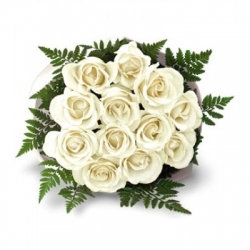 A simple bunch of 12 white roses with green fillers to express your feelings. White carnations are symbol of purity, love, faithfulness and good luck. 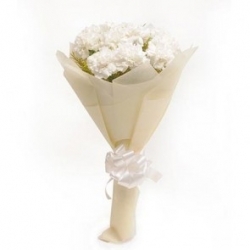 A lovely bunch of 10 white carnations with fillers, neatly wrapped in a white paper packing with a white ribbon when presented as a gift brings delightful and extravagant experience. Order now at FB Flower Basket! Yellow carnations shall brighten up the dull day with their sun lit charm. 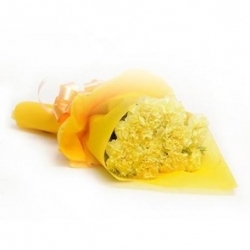 Bunch of 10 Yellow Carnations in yellow paper packing with matching ribbon. Order now at FB Flower Basket! 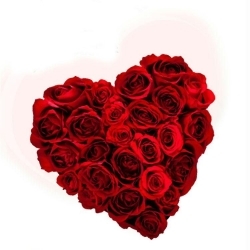 A bouquet of deep red carnations indicates a deep, devoted love from the sender. 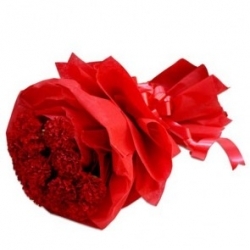 A Bunch of 10 Red Carnations in red paper packing with matching ribbon. Only at FB Flower Basket. 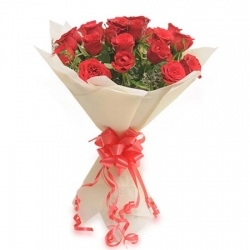 A bunch of 15 red roses wrapped in white paper tied with a red ribbon to give an elegant look. 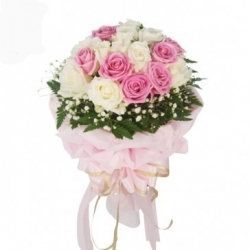 A beautifully paper wrapped 12 pink and white roses bunch from FB Flower Basket to surprise your loved ones. Designed & Developed by ReformCart © 2015 All Rights Reserved.